← Someone make sure I’m not a pod person! There is one thing that a home garden doesn’t provide: instant gratification. The instant I harvest something is only one moment of gratification. Eating it is another. Two moments of gratification–cool, huh? Three, if you count the successful feeling of sowing the seeds in a well-ordered garden. Carrots are the ultimate vegetable for teaching patience. They take the longest to sprout. In fact, they take so long, I sow a few radish seeds with the carrot seeds so I can keep track of the row. By the time the radishes are taking shape, the carrots are pushing up through the ground. By the time I harvest the radishes, the carrots are tiny, little bitty hints of roots. So why not run to the grocery store or farmers’ market to buy a bunch of carrots and have instant gratification? Because home-grown carrots are the best tasting carrots I’ve ever eaten. We start thinking about our orange root vegetables the second we plant them. Yes, they are that delicious. While the little tiny roots are taking shape, we have to take care of them. They need the usual water and sun but not too much heat. They also need space and soil that allows them to grow down, or they will grow around each other and at odd angles. If we want the biggest, best carrots, then we have to thin the row and wait. 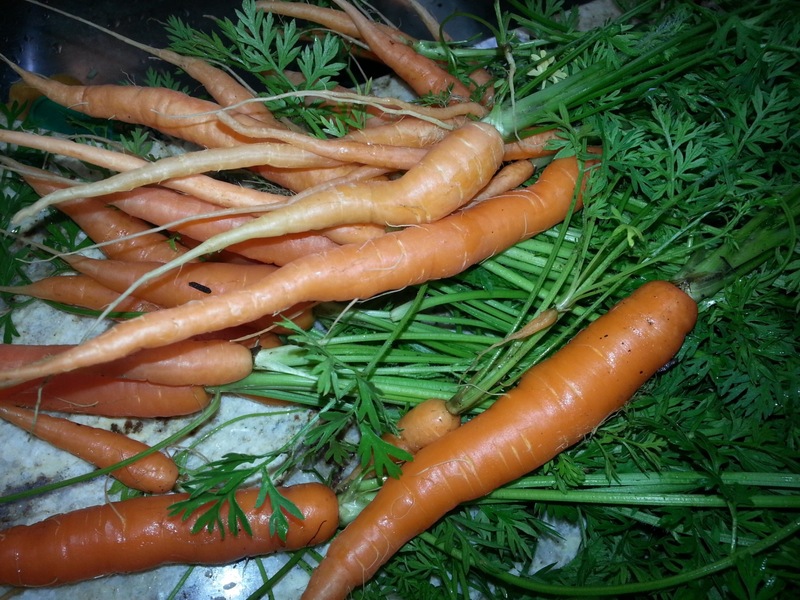 Even pulling the smaller carrots to make room for bigger ones later is a reward. These “baby” carrots are tasty, too. They also remind us that better veggies are still to come and that we shouldn’t give up on the goal. Sounds a bit like patience and working toward a goal, doesn’t it? We have goals that we want to achieve, but we can’t expect to complete them overnight. We must take baby steps or have smaller goals that lead us to the ultimate goal. I have friends who climbed Mt. Ranier last summer. They planned for it and worked up to it. They didn’t show up at the base of the mountain and start climbing the minute they decided to do it. They were patient, organized, and safe. They trained and climbed smaller mountains until the time was right to conquer the big one. If we have too many goals (too many carrots crowded together), then we have a hard time focusing (have nowhere to grow) on the ultimate prize. In our digital, fast-paced culture of instantaneous chatting and information gathering, we can’t rush quality work. We can do things that help us be more efficient, but a carrot takes about 3 months to grow. Some take longer if they didn’t have room from the beginning. If you look closely at the picture of my first harvest, you’ll see a tiny pale root next to the largest carrot. It got pulled when I thinned them. If I’d seen it, I would have put it back into the row so that it could keep growing. I can’t be devasted that I missed it–the space will be taken up by another, bigger carrot. We have to reevaluate our goals from time to time, which means throwing out ones that don’t fit our needs anymore. Then we have to wait some more. Even mountain climbers have to change plans if the weather turns unsafe. While some of my goals take longer and require more patience, I’m going to be happy with my small steps of achievements that are getting me there. And eat a few carrots along the way. What goals are you working on right now? What things do you do to help yourself be more patient?